The factory head lights in he Jeep Wrangler JK's leave a lot to be desired. 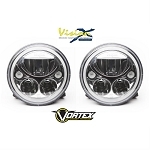 There are many aftermarket options available for upgrades these days, and one that truly sticks out as a leader is Vision X and their Vortex 7" Round LED Headlights. The Vortex LED light is a DOT approved headlight putting out 4,210 raw lumens each. They feature two 13W LED's for the low beam, and four 10W LED's for the high beam. As a pair, these lights will put out 8,420 raw lumens, which equates to 5,894 effective lumens. As an added bonus, the Vortex light features an LED halo ring which can be wired in separately to your turn signals, marker lights, or daytime running lights. Remove the top fasteners on the grille all the way along the top. Pull out on the grille along the bottom to release the clips holding it to the grille header panel. Set the grille aside. With the grille set aside you can now remove the factory head lights. 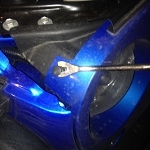 With a T15 torx driver, remove the 3 torx screws per light to remove the retaining ring. Pull the headlight out and unplug it from the wiring harness. Plug the supplied H13 adapter harness into the factory plug, and then wire the single white halo ring wire to the factory marker light harness. You can pull back the wire loom and access the middle wire of the stock plug. The passenger side wire will be white with an orange tracer, and the drivers side is white with a green tracer. Use the supplied wire taps to splice into these wires. Plug the Vortex headlight into the VisionX wiring harness previously installed in step 3. Place the light back in the light bucket and secure it in place with the retaining ring and 3 torx screws previously removed. Replace the grill by setting in place and pushing the lower portion in to secure the lower clips. Replace the top plastic fasteners along the top. The halo ring will come on with your marker lights if you followed these instructions. 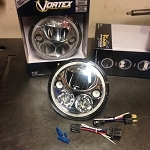 The Vortex light has a much brighter light and a sharper pattern than the stock head lights. The low beams have two small LED's that spread light out directly in front of the vehicle, while the two 13W LED's throw out light for distance and to the sides. 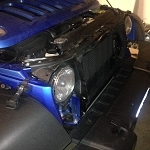 If you are installing the Vortex lights in a 2013+ Jeep Wrangler JK, you will need a pair of anti-flicker harnesses. At this time, Vision X does not have a harness, but we have found that the Trucklite brand harnesses work well with the Vision X lights. This will eliminate the flicker that you get when installing LED lights on the Jeep Canbus computer system. You can get your pair of Vortex LED Head Lights from KD Fabworks and get rid of the dismal factory head lights!